So, you consulted our list of tips and tricks for finding an apartment, and you FINALLY found a home in NYC. Unfortunately, apartment hunting is only half the battle. Actually moving your stuff to the new place is next, and it’s about as fun as planning for the L Train shutdown while stuck in an escape room with no A/C in August, only to re-emerge into a dystopian hellscape where boozy brunch is banned. That is, it’s no one’s favorite weekend. That’s why we’re here to make the whole process a little less nuts. 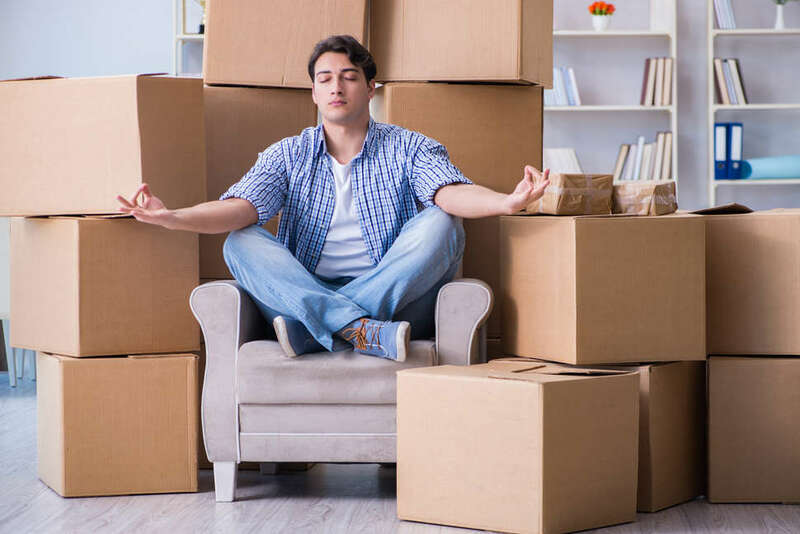 Below, you’ll find an exhaustive guide: hacks, tips, and services (including some notes crowd-sourced from friends) for moving as efficiently and inexpensively as possible. Welcome home. You can change your mailing address online here -- it takes 10 days to process. Credit card companies, student loans, Con Edison, and your cable company need to know you’re moving. Log onto your Con Ed account and click “Services and Outages” to change your address and shut off service at your old apartment. Also a good idea? Alert doctors, banks, and HR at your office. Some doorways in NYC apartments are insanely small, and you’ll want to be sure your sectional sofa will fit through the door, and in the actual living space, before you lug it up five flights. It’s time to be discerning. You probably don’t need the cumbersome armchair in the corner that no one sits on... ever. And you definitely don’t need that record player that looks like a suitcase that you got at Urban Outfitters. Instead of throwing them away, donate them, sell them on an app, or put up flyers in your building and have a good old-fashioned stoop sale. The less stuff you have to move, the cheaper and less time-consuming moving day will be. For reliably sturdy and new boxes, City Moving Boxes sells new boxes and rents reusable ones with free same-day delivery. Buy/rent boxes and bins by the piece or in entire kits, based on how much you’re moving. (Example: a one-room kit costs $72.90 and comes with two XL boxes, five large boxes, six medium boxes, six small boxes, 50 feet of bubble wrap, three rolls of tape, and a marker.) Reusable plastic boxes are organized the same way. With Bin It, a mini-storage system, a set of stackable plastic bins will be dropped off at your place, and picked up at your new pad after your move two to four weeks later. U-Haul also sells cardboard moving kits/boxes by the piece. Boxes found through a quick search of “moving boxes” definitely might (read: will) fall apart, but they will be free. The free section is also excellent for getting rid of old furniture -- most people are happy to handle pick up if they think they’re getting a good deal. Establishments that receive major deliveries on the reg will likely have a large supply of cardboard that they’re looking to unload. Try the closest grocery store/liquor store/furniture store and let them know you’re looking for shipping boxes. “If you go with this option, stock the fridge with beer and wine BEFORE moving your stuff in so it has time to get cold," James H. says. "Nothing is worse than the ‘are the beers cold?’ check every five minutes." Solid advice, James H. Solid advice, indeed. This way you can use the subway or cab to bring stuff to the new place over a few days, which will eliminate the bulk of the work on the actual day. Even if you have to pay for the extra days, it's often worth it, particularly if it enables you to get a better deal on a truck/movers. And take smaller items over in shifts. Zipcars run from either $9.25/hour or $89 for the day (plus a $25 application fee and an annual fee of $70 if you’re new), so be sure of how many trips you need to make. Keep in mind though, most cars won’t be big enough to fit a mattress! Pickup trucks and 9-foot vans start at $20 a day plus mileage. Rates vary by zip code, but 10-foot trucks will run you about $150. Take note: anything larger than a van is considered a truck, so be sure to map out a truck lane route if you move between boroughs. If you’re moving in the summer, trust us. Cops are always happy to write tickets for double-parked trucks and vans. Describe the task you need done -- help packing, help with one large item, or someone to move your entire apartment (van included) -- and the site finds local “taskers.” Each tasker has their own hourly rate, along with user reviews and recommendations. Depending on what you need, prices vary from about $40 to $100 per hour. There’s a gazillion of these guys around, some of dubious credibility, but Man With a Van or NYcityVAN are good places to start. Unlike moving companies, whose rates fluctuate depending on multiple factors (square footage, distance moved, items to be moved, and stairs or elevator), man with a van prices are pretty static and cheaper overall. It’s the easiest (read: most expensive) way to move -- you likely won’t get away with spending less than $400, including tip. Just keep in mind, most companies require you to submit a detailed inventory or even schedule a house call to get an idea of your space and how much they’re moving before giving you a quote. For a small studio with minimal furniture, Rabbit Movers will probably run you close to $400. But obviously if everything in your apartment is large West Elm pieces, the price will reflect that. Some companies like to show up and screw you by charging extra for every little thing. Dumbo Moving is not one of them. Clean Cut Moving breaks pricing down by apartment size. A barebones studio apartment move will start at around $300, and a two-bedroom will go run about $600. Intense Movers is known to have similar rates, and FlatRate Moving starts at around $500. Move on an "off day"
If you do decide to use professionals movers, they’re usually busiest at the beginning and end of the month, and weekends. Negotiate a discount by moving mid-week or mid-month. Five percent per mover is industry standard -- in other words, the least amount of money you can get away with. If you were lucky enough to score a professional move for just $400, that’s only $20 per person. Wouldn’t it feel nice to double that amount? Or even make it a nice, crisp, $50 per person? You’d still have moved with pros like some kind of Rockefeller for under $500. If they were on time, efficient, and didn’t break anything, no one’s gonna balk if you give them a little extra. Meagan Drillinger is a freelance writer for Thrillist and has exactly four pieces of furniture because moving is that much of a pain. Follow her on Twitter, Instagram, and Facebook.